Whether you’re part of a healthcare agency, financial organization or educational institution, policies and procedures play an integral role in any organization. Many organizations write and manage their policies and procedures in Microsoft® Word and save as PDF, printing and distributing as original documents. However, policies and procedures may frequently need to be updated to address the evolving needs of the organization as well as state and federal guidelines. And what if that content needs to be online, in an easily searchable format? 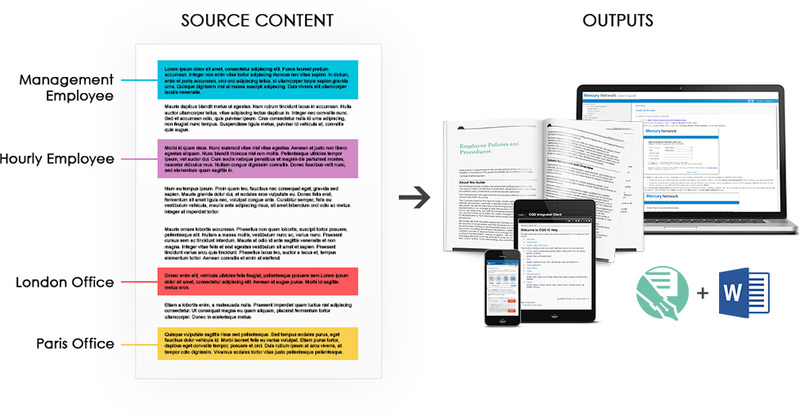 Doc-To-Help gives policy writers, content developers, technical communicators, HR managers, and administrative staff the ability to easily create, manage, and publish content, all within Word. With Doc-To-Help, the process of creating policies and procedures is streamlined, and publishing policy information to both print and electronic formats such as PDF and online formats such as NetHelp (HTML) is easy. View the online Help topic here. NetHelp is a cross-platform, browser-based output that is displayed in the user’s default browser. It is uncompiled HTML Help, so the number of files delivered for the project will depend on the number of topics in the project. Also, NetHelp is jQuery-based. jQuery is a flexible web technology that separates content from presentation and is easy to customize. If you need to create an output that can be hosted on your web server, but still be accessed through the application, you should create NetHelp. It produces HTML output that is browser-based and can be hosted locally or on any web server. True Separation of Content and Presentation: Doc-To-Help outputs raw XML and NetHelp consumes it. NetHelp is merely the set of scripts and pages used to display and lay content out. In fact, you can use the raw XML output with your own systems. That is how we are able to create SharePoint wikis. Best Looking, Most Themable: The promise of jQuery UI is to deliver a standardized and easy-to-edit set of styling standards. That promise carries through to NetHelp. It ships with many of JQuery UI’s default themes and a few of our own. The icing on the cake is that it is simple to edit. You can use our theme designer, edit the CSS file directly, or use the Theme Roller found on jQuery UI’s website. Lightweight: As already mentioned NetHelp output is only a set of CSS files and scripts. Files sizes are small and performance is fast. Unique URLs: With NetHelp output, URLs to every topic are displayed in the address bar. This helps search engine optimization (SEO) if you are deploying publicly. It also makes sending links to topics easy. Streamline communications and reduce inefficiencies between you and your employees. Whether you’re a small business or a large organization, Doc-To-Help can create, maintain and publish guidelines, disclaimers, statements and more. Give your medical and administrative staff a comprehensive reference point that they can rely on up-to-date information. With Doc-To-Help, staff can depend on updated documentation to encourage workplace safety, standardize practices, and promote compliance. Ideal for organizations of all sizes, Doc-To-Help enables human resource managers and administrative staff to effectively manage essential information throughout the company. When it comes to establishing clear and consistent IT policies and procedures, Doc-To-Help is a reliable solution for IT and technology departments. Create policies and procedures on information security, computer usage, network management, and more. As much as 50% of your policy content may be duplicated across multiple document sets. Stop duplicating content and adopt a more efficient content workflow. Doc-To-Help integrates seamlessly with Microsoft® Word, giving you an enhanced, efficient authoring environment for policies and procedures, regulatory information, and more. Rather than forcing users to convert Word documents into a different format, Doc-To-Help installs a toolbar into Word, bringing powerful editing and content management features into your authoring environment. When you need to create or update policies and procedures, it can all be done easily within Word. Policy and procedure management is simple with Doc-To-Help. When updates need to be made, Doc-To-Help makes it easy to apply changes to a single, master document and apply across multiple versions. Doc-To-Help improves the content workflow by creating an easily deployed central website with automatically generated TOC, “See also” links, search engine, and more. When it is time to update, all you need to do is update the site. With Doc-To-Help, publishing to the desired format is easy. 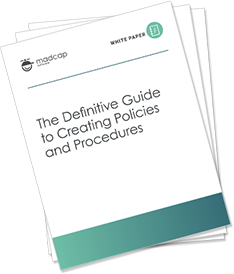 Policies and procedures can easily be created for both print and online, in a variety of outputs. Whether you need to adapt your policies and procedures for responsive web, PDF, NetHelp, mobile, or ePub, Doc-To-Help can quickly and effectively ensure that the information are delivered to the right user.